We have a fantastic batch of Colour Ricoh Aficio MP C3003 photocopier, printer, scanners that have come to our workshop ready to be fully refurbished so we can sell them at a fraction of the cost of new. These copiers are for sale with the added bonus of having the optional service agreement. We are selling these fabulous multifuntional devices at trade prices, a bargain not to be missed. The Ricoh MPC3003 is a strong, sturdy machine that will perform well in a busy office environment. The Ricoh mentioned is configured as per below. All of this for just £1295.00 + vat for the months of April/May while stocks last. We offer service agreements if the machine is to be located within our service area. This area covers most of Kent, London, Essex, Surrey and East sussex. We also offer a delivery and installation service. J&K Business Machines are the photocopier specialists that will not let you down. its that time of year, when we like to de-clutter our homes, well now is aslo a good time to de-clutter your office. 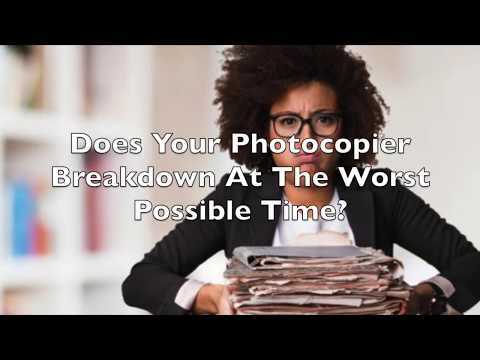 Do you have any unused photocopiers that are gathering dust? Not sure what to do with it? give j&K business machines ltd a call on 01233 668309. We buy used photocopiers, we may want to buy yours! Are there any stairs to contend with if we were to come and remove the photocopier? Once we have this information, we can let you know if we wish to buy your redundant copier. Please get in touch today with the above information. Why pay to have your copier taken away when we may possibly pay you. Very exciting changes here at J&K Business Machines LTD.
New ownership. New Directors. New Deals. New offers. We have been working very hard this year to fine tune the workings of our successful photocopier company. With cexcellent customer service at the forefront of our agenda. We have been exceptionally proud that we have had the loyalty of our customers over the years, some have been with us since 1991! We have made it our aim to continue and improve our customer support system. Word has obviously got around about our service, we have had a lovely flurry of new customers, and we want to ensure they receive the best service for their photocopiers, copiers, printers, mfps that the industry can offer. Call us today if you are interested in buying or renting a refurbished copier. And one of our highly experienced team will be able to help. we offer woderful easy to understand service agreements, we do not hide added fees into our contracts, we keep things simple. We tell you what the cost per copy is, and thats it, no hidden extras. Our service agreements include all callouts, parts, toner and telephone support. We have hundreds of very happy customers that continue to use us because we are honest, reliable, affordable and keen to go the extra mile. J&K Business machines have lasted the distance where other copier companies have failed. We believe this is because our agreements are crystal clear. No hidden extras. We have saved our customers thousands over the years, and we will continue to do so. If you would like to call us to chat about your photocopier printer scanner needs, call us on 01233 668309 and we will gladly talk you through your options. 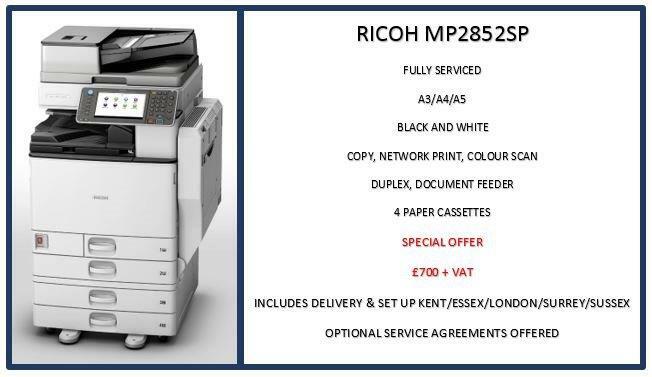 We have a selection of Ricoh MP2852sp photocopiers in stock that we are selling at crazy low prices. These are laser printers that are extremely good value. These are black and white copier printers with the capability of scanning in colour. We are selling these whilst stocks last for just £700 + vat. If you wish for the copier to be delivered further afield, please contact us on 01233 668309 for a quote. This model is a stylish black and white multifunctional that can handle A3 papers. It is packed with advanced and cost-effective features. You can copy, print via USB and network scan. All this comes in a compact package. This model has the smallest footprint in its range. It has a short warm-up time and fast printing speeds. It has standard duplexing and colour scanning. It has a wide media handling capability and high paper capacity. It is also affordable. who will buy my photocopier printer? Are you wondering who will buy my used photocopier? We buy many different office photocopiers. What is the model number. Are there any stairs involved in removing the photocopier. Does the photocopier printer work. Once we know these details, we could be offering you money, and we come and collect. You may have one photocopier, or you may have dozens of photocopiers for sale. If the copiers are the makes and models that we like, we can be offering very competitive prices per machine, and take as many as there is available. We are based in Ashford, Kent, however, we do travel the country for the right mfps. Call us today (01233 668309) to receive a quote on your unwanted used photocopiers. We aim to give you an instant quote over the phone, but where this is not possible, we request your contact details, and we hope to get back to you within hours of your enquiry. more photocopiers printers and scanners have arrived at our busy warehouse. Our engineers are flat out preparing the copiers for resale. We have high speed photocopiers, and small office printers, we have so many to choose from. Whatever your requirement, Im pretty certain we can find exactly what you need. We are based in Ashford, Kent, but we cover a large part of the south east, so if you are looking for a fully serviced photocopier with the option of a simple, contract free service agreement. You have landed on the right page. We sell laser photocopiers, laser copiers, laser printers, wide format plotters, mfp, mfd, network print, scan to email, fax machines all at incredibly low prices, we can suit mosts budgets. 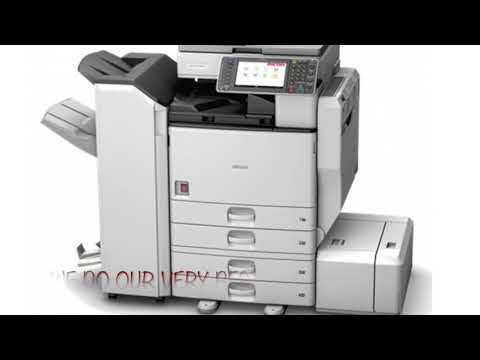 We offer a delivery and set up service of your copier printer. We can take your old copier away, we may even pay you for the old used photocopier. our service agreements include all callouts, parts, toner, phone support, postage of toner, firmware updates. All you need to do is supply paper and electricity, and you are good to go. We have many happy customers in Ashford Dover Folkestone Deal Hastings St leonards Bexhill Eastbourne Southwark Ilford Maidstone lewisham and many other areas in Kent london essex sussex and surrey. We offer fully serviced copiers at a fraction of the cost of new. We offer exceptional optional service packages with no hidden fees, no annual increases and no lengthy contrats. We have just taken delivery of another 30 quality Ricoh photocopiers. And it appears that they are selling faster than ever before, possibly because we are doing the best ever deals! Our warehouse is resembling a conveyour belt! The copiers come in, the highly experienced engineers fully refurbish them, they get passed over for vigourous testing, signed off, loaded on to one of our vans, then installed by our installation specialist. result – Happy customer. Job done. Call us today to start saving, we have customers that have been using us since 1991, they refuse to go anywhere else as they know that get quality products, quality service and super savings. Fully serviced photocopiers at a fraction of the cost of new. With the benefit of a fantastic service package that covers the cost of toners, parts, call outs and support. A very successful week at J&K Business Machines ltd.
Photocopiers are arriving, being stripped by our highly experienced Engineers, fully serviced and sent back out to our very happy customers. We know they are happy as many of them have been using our services for over 25 years. Huge savings to be had. Call us today on 01233 668309 to see why we have had loyal customers since 1991. Low cost photocopier short term rentals. Photocopier and printer repairs. To enquire about this service please call us NOW on (+44) 01233 668 309. JK Business Machines © 2019. All Rights Reserved.